New for May 2008! 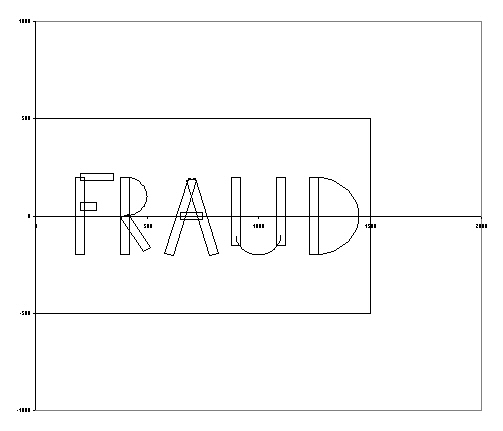 FraudoCAD is a free two-dimensional layout tool. 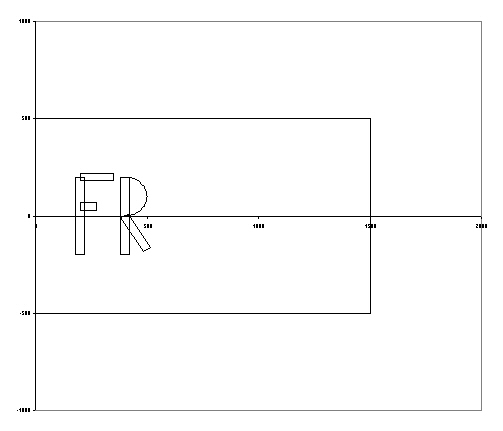 Like AutoCAD, it allows the user to input "polylines" and arcs. But AutoCAD costs thousands of dollars. There's tons of free software out there that can do crude layouts. Problem is that a lot of big companies are now paranoid about the risks of employees downloading free software. So what's a mother to do? Enter FraudoCAD! The name is a Portmanteau for "free AutoCAD" but we thought that changing the "t" to a "d" adds to the entertainment value of the title, and it sounds cooler than "Excelo-CAD" but that was a close second choice thanks to Matt. It uses Microsoft Excel, which you probably already have. You don't have to worry about downloading it and getting in trouble with the IT police, it's merely an Excel file, right? 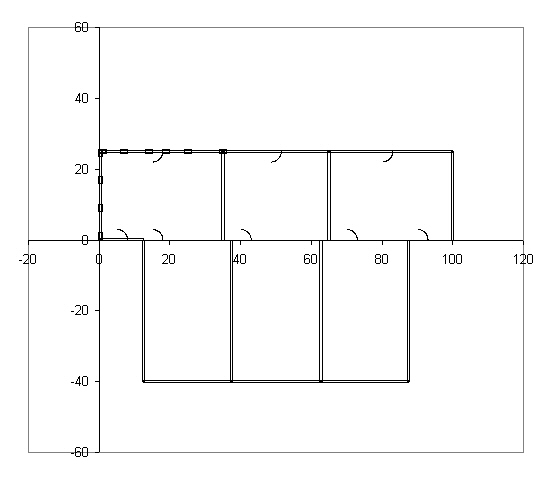 Here's an example of using FraudoCAD to generate plans for a block wall for a triplex house (wall starts at Y>0, existing house is located at Y<0, dimensions are in feet). The drawing isn't finished, but this assignment was the initial reason for developing FraudoCAD. We'll post a photo of the wall in a few months. Turns out it's gonna cost more than $7K! Good thing we all make the big bucks. Here's how to begin your own FraudoCAD drawing. Figure out the "extents" of your drawing (extents is an AutoCAD term for the maximum dimensions of the drawing), and enter a "polyline" defining the extents. 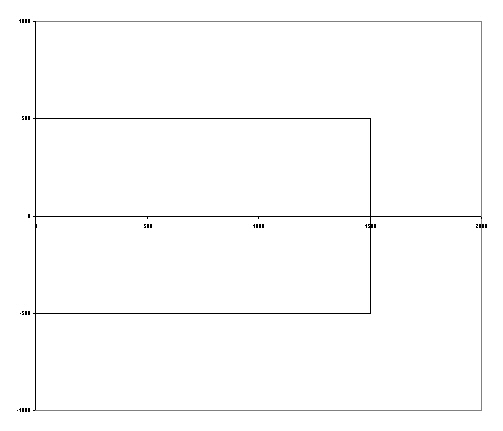 Then spend some time on the plot, defining the page size, margins and and axes so that X and Y scales are similar; this is the hardest part of the FraudoCAD experience. Here we defined the extents to be 1000 x 1500, in undefined units. Pretend it's a integrated circuit, and the dimensions are in microns, if you like. 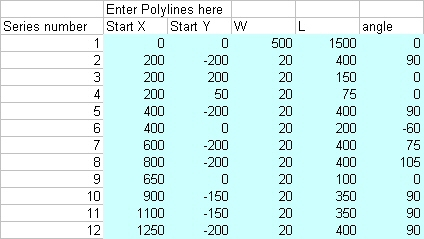 The polyline width is 1000, the length is 1500, the start point is 0,0, and the angle is 0. Now start laying down some features using polylines. 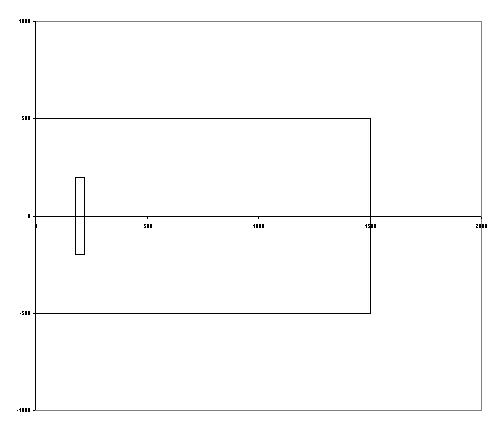 Here's the first one, a polyline of width 20, length 400, start point 200,-200 and angle 90. Here's a few more, along with an arc. The arc start and stop angles are what you'd use if you were in polar coordinates. The arc shown starts at 90 and stops at -90 degrees, with a radius of 100 and a center of 400,100. Here's a few more features. In the future, we plan to add "plain" lines (no widths) and "poly arc"s (arcs with width) to the mix. If you have any other ideas, modify the Excel file and shoot it back! One of the attractions to FraudoCAD is that you can parameterize the features with equations. For example, in you could make the height of the letter we drew equal to a single cell which you could vary. Even Einstein couldn't do that in Microsoft Visio, Dude! Be sure to reference FraudoCAD when you use it in your next DARPA proposal. One more thing. If you consider yourself a "power user" of Microsoft Excel, that's nothing to be proud of. Get a life, starting with a gym membership, you nerd!